What is PetSafe No Bark, No Shock Dog Collar? The PetSafe No Bark, No Shock Dog Collar allows you to safely train your dog to stop unwanted barking. The lightweight collar automatically emits a harmless spray of citronella after your dog barks to stop excessive barking. The unit has a LED battery life indicator and a see-through reservoir to monitor the levels of citronella. NOTE: PetSafe No Bark, No Shock Dog Collar Spray Refills are also available, sold separately. The PetSafe Dog Collar automatically releases a spray each time your dog barks to correct excessive barking. It comes with an unscented spray, or you can also purchase a refill in citronella. Citronella is a plant-based fragrance, which is completely safe for dogs. The spray, which is directed towards your dog's snout, interrupts your dog's barking pattern by spraying your dog. Most dogs will stop barking with regular use. The spray can be adjusted to give your dog a short spray or a long spray depending on his or her barking habits. For use on dogs only. Do not attach walking lead to collar. Monitor your dog's reaction during initial use. For detailed installation instructions, please read the PetSafe Dog Collar manual. 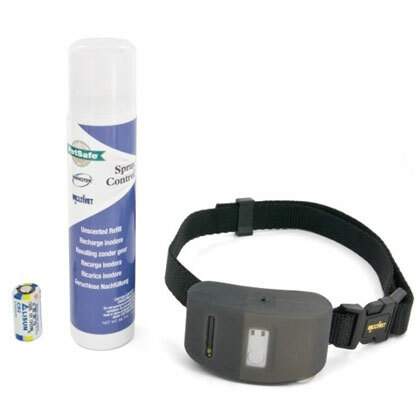 Installing spray device on collar: Remove the keeper from the black collar. Pass the black collar through the loops of the spray device. Put the keeper back on the collar. The curved edge of the keeper should face inward. Feed the free end of the collar into the slot of the buckle that is closest to the logo, from back to front. Thread the free end of the collar through the outside slot, from the front to the back. The free end should now hang on the outside. The intensity levels range with the lowest number being the lowest level and highest number the highest level. It is recommended to begin training at the lowest level. Gradually increase intensity if your dog continues to bark. Closely monitor your dog's reaction to find the correct stimulation level. Take off all other collars and place the spray collar around the neck, directing spray valve toward the snout and unobstructed from dog hair. Adjust the collar for a proper fit by allowing two fingers space between your dog's neck and the device. Check the collar regularly to making sure it is well adjusted. Your dog must get used to the device before actual use. It is recommended to have your dog wear the collar for 4 to 5 days before inserting the battery and filling the device. Remove and put the collar back on your dog frequently during training period. Filling the device: Set the device on a flat surface with the fill-up valve (the deepest cavity) turned upwards. Shake the spray can before using it. Hold the can upside down, then insert the aerosol tip in the fill-up valve and press down firmly for 10 seconds. Release pressure and press down for another 10 seconds and release. Inserting battery: The battery compartment is on the same side as the fill-up valve. Remove the battery cover by twisting it and insert the 3-volt battery (the + end first). Twist the cover to close (a coin can be used to open and close compartment). Turning device on and off: To turn on the device, press the grey button on the front of the device. The green light will flash once, indicating the power is on. The green light will flicker every few seconds. Your device is now set to short spray mode. To change to a longer spray, press the same grey button once. The green light will flash twice to confirm the new spray setting. To go back to the shorter spray, press the button once again. To turn off the device, press the grey button until the red light flashes twice. The green light will no longer flicker. Note: It is recommended to test the device by blowing into the microphone. Adjust the spray collar onto your dog's neck with the on/off button facing outward and the fill-up valve and battery cover facing downward. The collar will now react when your dog barks. The collar should not be worn for more than 8 hours a day.